Any efficient marketer will always suggest you to understand your customer’s mindset before planning to run a successful marketing campaign. When it comes to search marketing, this thing gets even more imperative. It is then vital to understand the basic principal behind how different people carry on with the search mechanism. Based upon the customer behavior, you will be able to understand and set the foundation for selecting keywords, making ad copies, and also the bidding techniques. There are several models that depict that there is a deep correlation between what the users type in the search engines and what they actually wish to purchase. 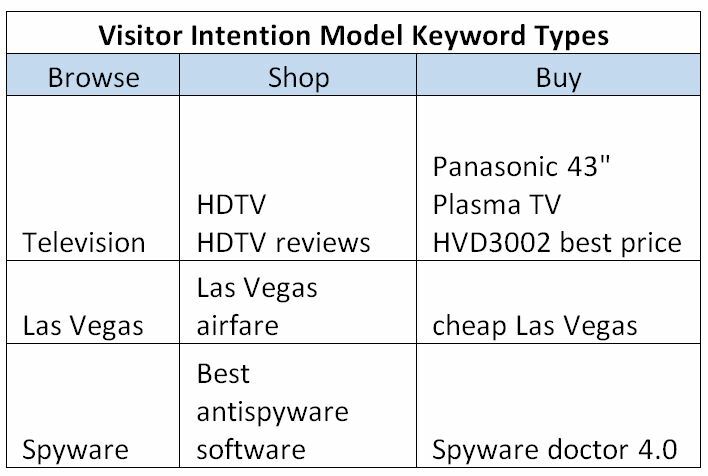 The famous Visitor Intention Model explains this correlation very well. According to this model, the marketers can easily predict at which phase the customer is, in the customer lifecycle and also how likely the customer is going to make a purchase based upon the search phrase. As per the Visitor Intention Model, search engine users basically fall under three main categories: Browsers, Shoppers, or Buyers. Let us now have look at how you can customize your PPC campaigns as per the type of customer. This guide will also help you in understanding which category the searcher belongs to as per the keywords used. The searchers that fall under the ‘Browser’ category are sort of information gatherers. In most cases, they make use of short phrases that are far from the exact specifications. Even though the overall traffic is high for such short phrases, most of the browsers prefer to look for details rather than the exact products. This is why the chances for making an immediate purchase are least. So, in this case the paid search ads targeting these phrases have quite low return. It has been noticed that browsers prefer to click upon the natural search results rather than the displayed ads. However, the twist is that if they do click, they are going to click over multiple ads so that they could accumulate as much information as possible. They prefer top down approach i.e. they look from top to bottom and become even more selective as they reach the end. Even low effective, but both the search engines and advertisers respond very well to browsers. You can always notice lesser or no ads for popular browse queries. The search engines instead utilize this space for reserved for PPC for displaying general information regarding the search query such as Wikipedia pages. As a whole, engaging with browsers can cause downward sales for PPC marketers. However, you can always make use of a well planned paid search strategy to offer the potential customers some detailed information about the product or service they have searched for. The information can be offered in the form of articles, discussion forums, white papers, and related stuff. You do not have to specify details such as cost, delivery, quality or guarantee. This is because the Browsers are there for details not purchase. You can try saving their email address to stay in touch and make sure that they return to the site in the future. These are a total contrast to the Browsers. Shoppers are the searchers who know what they need and are searching to evaluate the available options. They are generally very close to making the purchase decision and are in the phase of comparing the features and prices offered by varied brands offering the same products or services. The count for browsers is more than the shoppers at any given time, which is why you are far more likely to convert a Shopper. The search queries used by the Shoppers can be identified as the phrases having two to three words, most of which are comparison words such as ‘best’, ‘cheap’, ‘online reviews’ etc. Such keywords manage to earn a decent traffic and also raise the conversion rates. In this case, you can make use of descriptive terms referring to the product or service. You can further impress the Shoppers, while offering them comparisons with the products from competitive brands and some additional third-party testimonials. After all this is what the shoppers are looking for, to make the final purchase decision. When you respond to the Shopper’s data gathering needs, you are actually taking a step towards converting the Shoppers to Buyers. If not converting then at least you can grab some information and guess when they are planning to buy. Providing limited period offers will help in doing so. When compared to Browsers and Shoppers, Buyers are the most loved category for advertisers. They are always looking for a specific product or service. As soon as they find something that meets their choice, they go ahead with the purchase. They already clear with what they want and hence they do not invest much time in search. In fact, they spend maximum time over the vendor’s website. They type phrases that contain four or more words and prefer referring to exact products. Sometimes they even specify the SKUs or model numbers so search for what they are looking for, at the earliest. No matter is you use intimidating, emotional or impulsive appeal, it is going to work out anyhow as the Buyers have already made their mind and ready to make the final purchase. All that they want is a sudden push to make the purchase. You can offer them the much-needed push in the form of promotional offers or phrases such as fast shipping, high quality and low price etc.